No DNA, please - I'm British! Will you be at Family Tree Live? The term 'common law marriage' is one that most of us are familiar with, and the name implies that it has been around for hundreds of years - so it might surprise you to know that it has come into common parlance during our lifetimes. When the term was used in England in the 19th century - which wasn't very often - it generally referred to marriages that had taken place overseas, and which weren't recognised under English law. For example, I recently discovered that my great-great-great-great grandparents - who were born in Germany, but came to England to start a family - married in 1806, the year after their youngest child was born, and 13 years after the birth of the eldest child I know about (my great-great-great grandmother). My guess is that they had married before leaving Germany, but only realised belatedly that their marriage wasn't recognised under English law. The term 'common law wife' was used occasionally to refer to foreigners, but in the early 1960s, it was used when referring to West Indian immigrants, and gradually became used more generally. Nowadays around 90% of couples cohabit before marriage, but there are also many who cohabit without ever tying the knot. Times have certainly changed! In this issue I review two landmark books about cohabitation, both of which I found very interesting - though for quite different reasons. The first book was written at a time when there were very few parish registers online, making it difficult to confirm whether a couple were legally married, or cohabiting - the second was published only a few years later, but the author was able to determine the number of couples cohabiting much more accurately. This week we learned about another branch of the human family tree - an extinct species that lived in the Philippines around 60,000 years ago. If you missed the story you can find out more in the BBC article. In the last issue I reported that half of LostCousins members have tested their DNA, which is an amazing statistic - but what I didn’t reveal is the breakdown by country. As you would probably have expected, given that DNA tests have been on sale there for longer, the members most likely to have tested are the ones who live in the US - around 70% of those who completed the question have tested. But members from Canada, New Zealand, and Australia are not far behind, at 60%, 59%, and 57% respectively. The real shock is that, even though we're the nation that invented DNA testing, British members are trailing a long way behind at just 45%. It's no wonder that most of the cousins I've discovered through DNA live overseas! Remember, this isn’t a survey of the entire population, or of family historians as a whole, it's confined to LostCousins members - who are some of the smartest, most enthusiastic, and experienced family historians on the planet. Are we Brits afraid that when we test our DNA it might reveal that we've been researching the wrong line all these years? Or are we simply over-cautious? Whatever the reason, I'm going to my best to redress the balance, starting with a competition to win a DNA test. Wednesday 1st May will be the 15th Birthday of LostCousins, and to celebrate this achievement I'm giving away an Ancestry DNA test. I purchased it from Ancestry.co.uk, so it can only be used by someone in the UK - but since every LostCousins member either lives in the UK, or has cousins here, I hope you'll all take part in my competition. To keep things really simple I'm going to run the competition on much the same lines as my New Year Competition. Every direct ancestor or blood relative you enter on your My Ancestors page between 13th April and midnight (London time) on Tuesday 30th April 2019 represents an entry in the competition, and for each one you enter from the 1881 Census you'll get a bonus entry. Tip: a 'direct ancestor' is someone from whom you are descended, such as a great-great grandparent - most people just call them ancestors; a 'blood relative' is a cousin, ie someone who shares your ancestry. If the winner lives outside the UK they'll be invited to nominate a relative in the UK to receive the prize - and even if you live in the UK you can do the same (if you have already tested). Arranging for a cousin to test is a great way to maximise the value of your own DNA test - see this article in the last issue for an explanation. On Friday 26th April I'll be visiting the Family Tree Live show at London's Alexandra Palace - meeting old friends, making new contacts, and listening to presentations including Eric Probert's talk on 'Adoption in England and Wales' (which unfortunately clashes with Janet Few's talk on 'Early 20th century family history', one of the first to be fully booked). If you book a show ticket now - they’re only £12 - you can reserve free places at the lectures of most interest to you. There's a separate track for DNA, so you can overdose on it, or avoid it altogether - your choice. I'm planning to attend the panel discussion entitled 'The ethics of DNA testing', which should be interesting - even those who advocate DNA testing have widely differing views on some aspects. All over the world, there are people with unknown parentage who feel certain that they will never know the truth about their heritage. Perhaps their adoption records have been falsified, or maybe the information they offer is too limited. Perhaps there are no adoption records at all. For many people, the identity of their father is unknown. They have been told several different stories about their paternity – or they have been told nothing at all. For these people, fifty percent of the family tree is missing and the cold, empty space on the page is a constant reminder that half of the story may never be told. Why are some people denied information about their parents? Often it is to protect the parents themselves. In some cases, vulnerable young women who adopt-out their children may wish to conceal their identity for their own safety, or because they feel a sense of shame. They may withhold the father’s name to protect him from accountability or because he is refusing to support the child. They may themselves be uncertain of the father’s identity. The decision to withhold, fabricate, or share this information rests with the parents themselves, and whether it is right or wrong, we may never understand the circumstances which lead a person to decide that a child should not know the identity of one or both of their parents. However, the adoptee has been left with something – a record of their heritage and the heritage of their parents which cannot be falsified, withheld or retracted. This record is in their DNA, and using the techniques developed by genetic genealogists, we are able to access, interpret and extract information about an adoptee’s heritage without having to rely on the openness and goodwill of other people. Direct-to-consumer DNA testing is the tool which allows us to read the information in our genes. The process is simple – you purchase a testing kit, you wait for it to arrive in the post, you spit in the tube or swab your cheek, and then you post it back to the lab for analysis. Your DNA is then extracted from your sample, interpreted using the testing company’s algorithms, and most importantly, compared with the DNA data of every other test-taker in the company’s DNA databases. You then access the results via the company’s website using a secure login. If you are an adoptee, the day that you are presented with your list of relatives may be the first time that you have ever seen a biological relative. Most of these relatives will be very distant cousins. Perhaps all of them are distant. But they are people with whom you share ancestors. This is not a rumour, or a document of dubious origin, or an unreliable account of your parentage. This is truth. When we begin the search for the identity of your parents, we begin here, with this truth. If you have a half-sibling in the DNA database, then you share a parent with that person. The mother or father of that person is also your mother or your father. The next step is to discover which of their parents is also your parent. If you have a first-cousin in the DNA database, then you share a set of grandparents with that person. The next step is to discover which of their two pairs of grandparents are also your grandparents. If you have a second-cousin in the DNA database, then you share a set of great-grandparents with that person. The next step is to discover which of their four pairs of great-grandparents are also your great-grandparents. In theory, this formula can be extrapolated to any genetic relative, no matter how distant. As you can see, however, the number of potential shared ancestors increases with the distance of the genetic relationship. If you are faced with hundreds of distant cousins and very few close relatives, you might need to turn to a professional, who can help you to progress with your search using your existing data. You have as much right to test your DNA as any other person. You are no less entitled to learn about your heritage and to enjoy genetic genealogy just because you are an adoptee or a person with unknown paternity. You are allowed to exist. Anyone in the databases with whom you share DNA has made the conscious decision to take a DNA test and to make themselves identifiable and contactable by their genetic relatives. You are one of their genetic relatives. There is no need to feel guilty for sharing DNA with another person. Before the advent of DNA testing, there were laws protecting the privacy of parents who wished to remain anonymous, whether they were sperm or egg donors or parents adopting-out their children. The paradigm has now shifted, and the power to uncover the truth now rests with the children. The laws of nature dictate that every person can potentially identify their parents using their own DNA data. As with most things, there are no guarantees with genetic genealogy, but there is always the potential for a positive outcome. In some cases, it might be possible to identify your parents on the day that your DNA results are made available to you. In other cases, the process might be long and arduous. Sometimes you might need to wait for more relatives to test before you can progress with your investigation. But the situation is never hopeless, and as long as your DNA is present in the databases, at the very least you are making yourself traceable, even if you are not yourself actively searching for your relatives. You are entitled to the truth about your identity and your heritage. Use the gift your ancestors gave you, and never give up hope. Laura House is a genetic genealogist studying towards an MSc degree in genealogical studies at the University of Strathclyde. Her research focuses on the resolution of unknown parentage cases. The information in our DNA is a precious gift, but unless we use it carefully there's a risk that the discoveries we make can cause real harm. Although what I'm going to say applies particularly to adoptees (and the relatives of adoptees), anyone who makes an unexpected discovery as a result of DNA testing needs to take the emotions and circumstances of others into account. Since 1975 adoptees in England & Wales have been able to obtain a copy of their original birth certificate on reaching the age of 18. Those who were adopted before 12th November 1975 are required by law to undergo counselling before being allowed to access information that might lead them to their birth families - this is because their birth parents may have been under the impression that their adopted child would never be able to find out who they were. But counselling is also recommended for more recent adoptees, because it's important to appreciate that there is a wide range of possible outcomes, some positive, but others disappointing or even distressing. Consumer DNA testing cuts across the legal boundaries, allowing adoptees to search for their birth families without going through any of the safeguarding processes. But its reach is much wider - it can uncover all sorts of unexpected discoveries, from hidden adoptions to fertility treatment to illicit liaisons. When something unexpected crops up it’s rarely obvious what has happened - there are usually multiple explanations which are compatible with the DNA results, and the simplest explanation isn't necessarily the right one. As more and more family historians have added DNA testing to their toolbox I've been contacted by dozens of LostCousins members who are struggling to get to grips with their discoveries, both practically and emotionally. I'm not a trained counsellor, but I know enough to identify those situations where the input of a suitably-qualified professional is advisable or even essential. It's understandable that you might be confused, shocked, or hurt by what you find, and it may well be that you can’t discuss it with your nearest and dearest - but that doesn't mean that you have to deal with it on your own. All sorts of claims have been made for DNA testing, but perhaps the most misleading are those which imply that by testing our autosomal DNA we can find out about our ancient ancestors. An article posted earlier this week on the Forbes website caught my attention because it's written by Jennifer Raff, who is an anthropological geneticist with a PhD in genetics and anthropology. In the article she focuses on a particular test (offered by a company I'd never heard of), but they're not the only test providers to make claims about ancient ancestry. It's very easy to follow even if you don’t know anything about DNA, so I'm not going to attempt to summarise it - instead, I'd urge you to click on the link above and read it yourself (you don’t need to register at the Forbes site). When I was researching Dr Raff's background I came across a presentation she gave a few years ago on The Misuse of Genetics in Pseudoscience - you'll find it on YouTube, and although it’s an hour long it's well worth watching. And for a humorous look at DNA testing, check out the spoof site DNA Friend. Living DNA currently don't offer matching with cousins, but it is something they have long planned. Another alternative is to transfer results from Ancestry to MyHeritage - I believe there is a one-time fee of $29. It's inevitable that when we have difficulty finding the marriage of our 19th century relatives the thought crosses our mind that perhaps they didn't marry at all - so understanding how common cohabitation was, and the reasons behind it, are important. 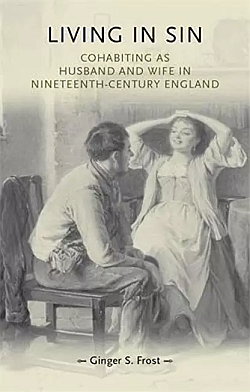 Living in Sin: cohabiting as husband and wife in nineteenth century England by Ginger S Frost, Professor of History at Samford University in Alabama, was the first book length study of this important topic when it was published in 2008. Inevitably the main sources of information are legal records, law reports, and newspaper articles. It was only around the time of the book's publication that the parish registers for London and Essex became available online - the former at Ancestry, the latter at the Essex Record Office's own site. But whilst the author over-estimates the extent of cohabitation, the reasons for couples living in sin are all too familiar - either they were barred from marrying because they were related, or else one or both were already married to other people. Before 1857 divorce required an Act of Parliament, putting it beyond the reach of all but a small minority, and even after that date the cost was prohibitive for many - and the grounds for divorce were limited, especially for women. For me the best part of the book are the real life cases that reached the courts for one reason or another. Living in sin was not nearly as common as the author would lead us to think, but that doesn't invalidate the examples. The book is well annotated, with notes at the end of each chapter, and an extensive bibliography at the back - should you want to follow up on a particular case you'll have no trouble doing so (though even now few of the records referred to are available online). We all have illegitimacies in our tree, and most of us also have examples of marriages which were either bigamous, or within the prohibited degrees (there are three examples in my mother's tree of widowers who married their dead wife's sister between 1834 when it was made illegal, and 1907 when it was legalised). Everyone will gain insight into their family's history from reading this book. Professor Rebecca Probert is no stranger to readers of this newsletter, but The Changing Legal Regulation of Cohabitation:From Fornicators to Family, 1600-2010 was not written primarily for genealogists - it’s one of many titles in the 'Law in Context' series from Cambridge University Press. "When I began this book, many years ago now, it was with the intention of simply charting the shift from the law treating cohabitors as fornicators to recognising them as 'family'. I had expected that the story would be on of the law gradually recognising cohabiting couples, being under the impression that cohabitation was common in earlier centuries. What I found was something quite different. Evidence of cohabitation in a particular place at a particular time had been relied on as proof that it must therefore have occurred elsewhere and in other periods. Limited anecdotal evidence had been endlessly recycled without any attempt to consider its reliability ... Every time that I investigated claims that were made about the prevalence of cohabitation. The evidence simply faded away ... The idea that a significant proportion of couples cohabited outside marriage before the late twentieth century turned out to be a complete fiction." Family historians tend to focus on exceptions - the handful of relatives who got into trouble with the law, the few who contracted illegal marriages, or the ones who bore children out of wedlock. We rarely sit down to calculate what percentage of all the individuals on our family tree they represent, so it's hardly surprising that we can form an impression that they’re more numerous than they really are. So this book will not only leave you better-informed, it serves as a salutary lesson in how to compile meaningful statistics about the world our ancestors lived in. But even if cohabitation before (or instead of) marriage was rare in earlier centuries, most or all of us will have examples in our tree - the numbers may have been exaggerated by previous writers, but we cannot ignore them altogether. I learned a great deal from reading this book - my copy has dozens of tabs marking passages of particular interest - and because it covers a period of more than 400 years there's enormous variety in the content. It's not an easy read, because it’s crammed with detail, and it’s not cheap - but I suspect that, like me, you'll find it enormously rewarding. I read the paperback version - it is available for Kindle, but the e-book is only slightly cheaper. When I checked Amazon today there were some used copies at around half the price of a new book - if you can find one in reasonable condition, snap it up! A new book from Nathan Dylan Goodwin is always a pleasant surprise, and this one is no exception - even though it isn’t another instalment in the Forensic Genealogist series featuring Morton Farrier. The unlikely heroine of Ghost Swifts, Blue Poppies and the Red Star is Harriet Agnes McDougall, a recently-widowed 65 year-old who has lost two of her three sons in the Great War. She's determined to find out what happened to Malcolm, the middle son, and when her only surviving son returns from the war she persuades him to help her in the quest. Should you need convincing that a respectable lady of mature years would defy authority in her dogged determination to find out the truth, let me remind you that she was only a little older than her near-contemporary Emmeline Pankhurst - and there are plenty of LostCousins members today who would fit the same description. The fact that Mrs McDougall consults a medium is somewhat at odds with her generally practical approach, but the creator of Sherlock Holmes, Sir Arthur Conan Doyle, was a believer in spiritualism even before his son died in 1918, so it's in tune with the times. That apart I thoroughly enjoyed the book, and if it turns that - as the sub-title implies - it's the first in a series, I shall certainly look forward to Mrs McDougall's next adventure. 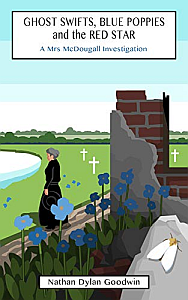 Ghost Swifts, Blue Poppies and the Red Star - a Mrs McDougall Investigation is available as a paperback or as a Kindle e-book that you can also read on a smartphone, tablet, or laptop. If you take advantage of the offer, do let me know what you find out! Finally, a reminder that if you have tested your DNA you won't get the best results unless you follow the advice in my Masterclass. Simply working down your list of matches is a very poor substitute for a properly structured approach!